A Nantucket vacation is a life-long dream, an item on the bucket list, for many. Most times, when I post a Nantucket picture, there are comments from people wishing they were there instead. I nod my head silently, in agreement, at my desk. Quaint. The quintessential one-word definition of Nantucket. Attractively unusual or old-fashioned. It is the allure of the island. The Roberts Collection will give you the Nantucket feels. 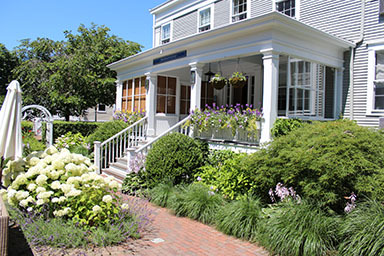 The Roberts Collection is located in the center of Downtown Nantucket’s Historic District, consisting of a family of four inns. The collection appeals to a variety a travelers whether looking for a high-quality boutique hotel or value-oriented indulgence. The Roberts Collection is the Roberts House, Meeting House, Manor House and the newly constructed Gate House. In the middle of these inns is a beautiful courtyard where you can relax, read, enjoy a drink and snack, or make plans for your day. Although you are downtown, the courtyard feels secluded from the rest of the world. The location of the Roberts Collection is ideal. You can walk to and from the ferry, and all downtown shops and restaurants within minutes. The staff is cordial and friendly, taking time to spend with their guests and answer questions, make recommendations, etc. They also give you complimentary beach towels! The Gate House, built in 2013, is my favorite with beautifully decorated, contemporary rooms. It even has state-of-the-art soundproofing which may “sound” silly, but if you’ve ever stayed at an old inn you know how AMAZING that can be! So yes, I absolutely recommend staying with the Roberts Collection. I stayed there last year, for a friend’s wedding, and it was perfect. Clean, comfortable, contemporary and conveniently located! What else could you need? A pool? We have Nantucket Sound instead. Want to relax at the Roberts Collection? 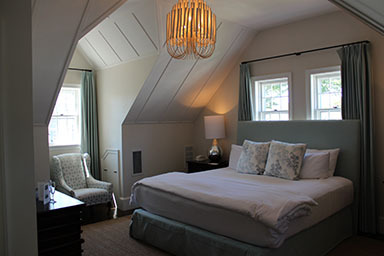 Enter to win our social media contest and select the Nantucket Getaway, which includes an overnight stay!